A wedding is the most important and special day for any couple. Everything has to be perfect, and a first-class service capable of making this happen, must be offered. Therefore, it is important to choose the best catering service possible. The food is one of the principal elements of a wedding as it represents the good taste of the bridge and groom, as well as the company providing it. Additionally, great care must also be taken at the time of choosing the dishes, since they will be directly appreciated and valued by each guest. Therefore, it is important to always offer the best, top-quality, options. We are always there, every step of the way, to offer advice to help the bride and groom make the right decisions about their wedding, such as the dishes which best match their personalities and in accordance with the style chosen for that day. We take great care each time to offer fresh and seasonal products to make our combination of traditional Mediterranean cuisine with an innovative and avant-garde touch, just perfect. Our personal stamp is found on every single one of our proposals, and this makes us unique. We have a detailed dossier available, in which prices, suggestions for canapés, starters, main courses, desserts, drinks, included services and fees, etc., can be found. All is carefully thought-out to make it easier for our clients to decide. In addition, we offer a personalized service, which adapts to the specific needs of each and every client. We like to prepare at least part of our dishes -if not all of them- on location, so they can be served, freshly-cooked and full of flavour. This is one of our strongest points and is what makes us different from other catering services, thereby bringing us much closer to the kind of service offered by first-class restaurants. Please, go ahead and take a look at our dossier and if you have any questions whatsoever, please don’t hesitate to ask us. 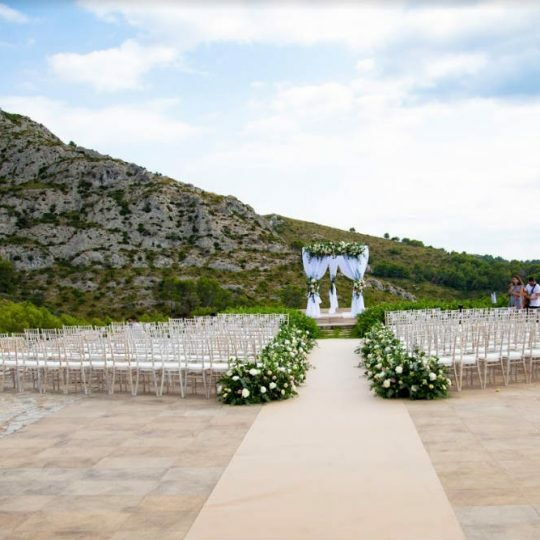 We will be delighted to help guide you towards making the best choices for your magical day! We hope to hear from you soon!